Early childhood professionals are often known for our big hearts and our wide range of knowledge of child development. Yet an undeniable fact about what we do is that we are providing a service to our children and families, in return for which, we receive payment. We are, by definition, a business. Administrators/owners of early childhood programs—you are tasked with making business-related decisions for your programs every day. In order for a business to sustain itself for any length of time, it must be marketed in one fashion or another. How do you get the word out about just how wonderful your program is to your surrounding community? And, once you get families in the door, how do you keep them? Create appealing, professional marketing materials that are free of spelling and grammatical errors. You want to convey the idea that children will be getting a quality experience at your facility. One of the quickest ways to sabotage this is putting out sloppy marketing information (business cards, brochures, flyers, informational packets, etc.). Answer the phone in a pleasant, professional, helpful manner. The person who answers your phone is the first point of contact a new family has with your program, and first impressions last. Encourage everyone who may answer your phone to use a standard, professional greeting. Make sure the public’s first encounter with your business is a positive one. Post a sign in front of your business. Make sure the community knows you’re there. Include wording about program events, or open enrollment spots, if possible. Maintain an online presence (Facebook, Twitter, Instagram, Google search, etc.). Post and tweet to your heart’s content about what’s going on at your program. (Just be sure you have family consent before posting any photos or information about children.) In today’s society, this is often the first way the general public becomes acquainted with your program. Ask local businesses to display your marketing materials. Go around to pediatrician offices, dance studios, sports facilities—places where families and children often go— and ask if they’ll let you leave a stack of business cards and/or brochures. You might even make a deal with them that you’ll display theirs in return. Offer a discount on enrollment to new families, or a referral bonus to your current families. As we all know, money talks. Giving a family a break on their initial enrollment cost is often made up in the long run when they stay at your program for an extended period of time. Rewarding your current families for speaking of your program in a positive light is a win-win situation for both of you, as well! Know your competitors—check out other programs in your area. Call around and compare tuition rates. Visit other programs and ask to tour their facility. Know what you’re up against. Maintain the “curb appeal” of your facility. Keep up your property to the best of your ability. During my years as an administrator, I spoke with many families who shared with me that they pulled into the parking lot of a program they were interested in only to turn around and drive right back out because of the looks of the place. Be conscious of “word of mouth.” People talk. They talk to each other at work, at children’s’ birthday parties and playdates, when you’re not around. You want to ensure that what they say is positive, so do your best to put the needs of your children and their families first, above all else, every single day. Provide a quality program. Follow through on your promise to provide your customers with a quality early childhood experience. Maintain the standards of quality that you know are the hallmark of a great program. Additionally, if you are star-rated in Ohio’s Step Up To Quality or Kentucky All STARS, display your banner—share that information with pride! Marketing your program, though it may not be your favorite part of the early childhood field, is necessary. Do it successfully, and you’ll be the most sought after game in town! This entry was posted in Directors & Administrators, Early Childhood, Kentucky All STARS, Step Up To Quality and tagged business side of child care, child care business, marketing on July 3, 2017 by Merideth Burton. Recently I had the opportunity to observe a teacher during outside time. This teacher was actively engaged with the children as she supervised her class. She took the time to stop and interact with them, constantly asking open-ended questions. As she walked around the playground she made comments to a small group of children using funnels and buckets in the sand box. At her next stop she helped children collect rocks and then sort them. She helped as children gathered and tossed leaves up in the air to watch them swirl around in the wind. The children giggled as she joined them in their shadow dancing/jumping game. As I debriefed with the teacher after the observation, one of the areas in which she requested support was science. I asked about past activities. Which activities she felt went well, which activities didn’t go well and why. With excitement in her tone, she dove right into telling me about her butterfly project last spring and how the children loved observing the daily progress of the transformation to the release of them on the playground. Then she discussed a volcano explosion demonstration that flopped. I believe reflection is an important part of the planning/teaching process in ECE (and even life in general). Understanding which element was successful or unsuccessful, why it went wrong, or how it could have been done differently is a great strategy for an educator to continuously grow in this field. After reflecting for a few moments, she said the volcano flopped because the children weren’t interested in it. As we began to problem-solve WHY the children weren’t as interested in the volcano as they were in the butterflies, she stated, “Because it’s not a real life experience for them. It’s not something they see in their everyday world.” I immediately thought, BINGO! If it’s not meaningful to children, they’re not going to be engaged. One of my favorite things in ECE is adapting and even disguising learning concepts through topics of interest for children and of course play interactions. Science in early childhood education is fostering a world FULL of wonder. While creating this world of wonder, your classroom doesn’t have to look like a science fair. So when you’re planning for your children, reflect on what is happening around them. What do you see them interested in and what are they asking questions about? What are they experiencing in their everyday world and how can you expand on it? This entry was posted in Best Practice, learning through play, Step Up To Quality and tagged preschool science, science, STEM on December 6, 2016 by Tracy Schnirring. Guest-blogger and Director of 4C Kentucky Services Julie Witten shares her thoughts on the role of early childhood professionals in advocating for children. “Never doubt that a small group of thoughtful, committed citizens can change the world; indeed, it’s the only thing that ever has.” Margaret Mead was on to something when she noted the importance of standing up for what you believe in. Despite this time of often sensationalized election coverage, it is important to remember what the democratic process—and the role of our elected officials—is really all about. Elected officials are chosen by the people to represent the people and are answerable to those who elected them. You may think that your opinion or your voice doesn’t matter or can’t make a difference once someone is elected. In fact, quite the opposite is true. All elected officials offer a variety of ways (phone, email or in person) for you to contact them, but first you need to know what legislative district you live in. To find your legislator in Kentucky click here and in Ohio click here. This video shows just how easy it is to make a call to your legislator! The Kentucky and Ohio state legislatures are in session now and representatives are making big decisions. So, this is a perfect time to contact your legislator about issues that are important to you. What do you say? Is it important to you that families have access to child care assistance funding? Would you like to see additional incentives for providers in STARS for KIDS NOW in Kentucky or Step Up To Quality in Ohio? What supports would help your small business to thrive? If these or any other issues rise to the top of your list, contact your representative. And, if you would like to see what statewide advocates for children and families are asking for, take a look at the Blueprint for Kentucky’s Children or Groundwork Ohio. Remember, it’s the duty of each elected official to listen to his or her constituents, the people who reside in his or her district. Each time you call or email, your exact words are registered on a green slip and the legislator reviews these each day. Let your voice be heard. Your opinion matters! This entry was posted in advocacy, Advocating for Children, STARS for KIDS NOW, Step Up To Quality on January 28, 2016 by juliacwitten. Several years ago, my youngest daughter was identified as “gifted” according to the standardized tests that children take each school year. Once she received this identification, the teachers wrote an education plan to address her specific needs at the beginning of the year and then provided me with a summary of how her plan worked at the end of the year. This year, in particular, I was so impressed with what the teachers shared with me. The teachers identified my daughter as a leader in her group. They also used words like “complex problem solving skills noted,” “deductive and inductive reasoning skills exhibited,” “empathy and kindness expressed for classmates,” and “excellent work ethic” to describe her. I am such a proud mom. I know these are all skills that are going to last her a life time. But I will be honest, I wonder if these skills were evident because of her “gifted” identification or if her high quality preschool education prepared her with these life skills. My daughter was fortunate enough to attend a high quality-rated preschool program during the early years of Step Up To Quality. Her preschool teacher spent many hours preparing the classroom environment, getting to know the children and educating herself on best practices to meet the needs of those in her classroom. Abby was blessed and so was I to have someone so dedicated to the field and best interests of every child she encountered. When I think back to Abby’s classroom environment, it was arranged so that many types of materials were available and accessible for her to interact with. The classroom belonged to the children and the teacher was there to support what she saw them doing by providing a safe place for them to be. Children in this classroom were able to take risks and share ideas because they were valued. Their learning styles were noticed and planned for. Endless time spent at the water table dumping and pouring allowed Abby to develop those initial problem solving skills. When Abby would get her shirt wet, her teacher never told her what to do to fix the problem but rather encouraged her to think for herself and asked difficult questions to allow Abby to solve her own problems. When Abby wanted everyday to be swim day in the summer, her teacher helped her create a picture calendar of events so that Abby (and the other children) could determine what would come before swim day and after swim day. She didn’t give them the answers, yet provided them the tools to find the answers on their own. She trusted and believed in their capabilities—giving them the confidence to hold themselves in high regard as scientists and chefs and engineers or anything else they wanted to become. My Abby has big goals. She hopes to be the first woman President of the United States. She wants to be a veterinarian and an author too. And I believe, because of the skills she learned early on, she can be any or all of those things. Most importantly, so does she. Thanks Early Childhood Teachers, I am forever grateful for the next generation of dreamers and thinkers that you inspire. 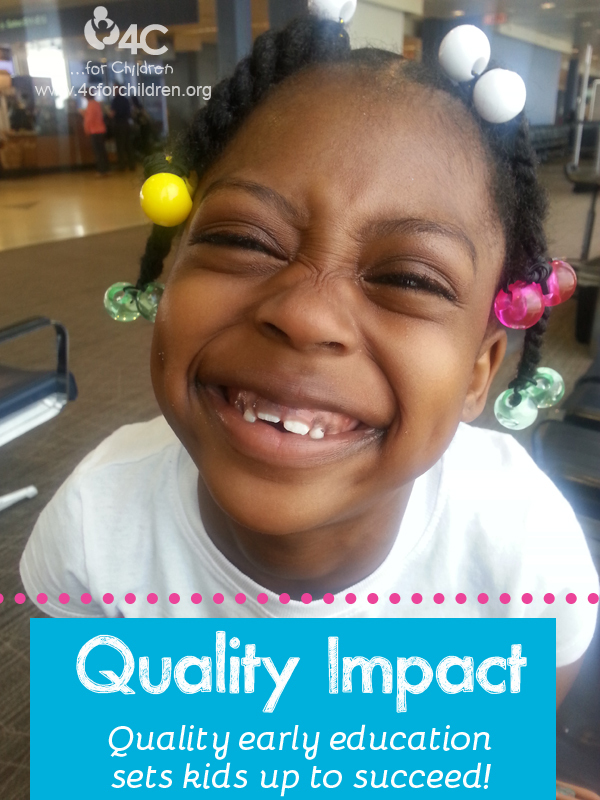 This entry was posted in Best Practice, STARS for KIDS NOW, Step Up To Quality on June 25, 2014 by angiegood. What does “quality” mean for parents? Greetings from a new mom! My husband and I were recently blessed to welcome our son into the world. It is everything and nothing like what I expected. One of the things I was expecting was to look for a child care program that would be able to meet my family’s needs. I wanted to share with you what types of things parents like us look for when selecting a program for our baby. Quality, professional, engaged staff in all classrooms. When my husband said “quality,” I had to ask him what that meant. I didn’t want to assume his version was the same as my own. He said that he wanted the staff to be professional and well-trained. My part was engaged staff. It’s important for them to be actively involved with the children in their care—from being down on the floor with the babies to playing board games with the school-agers. Both of us felt strongly that these qualities should be program-wide and not just in the age group our child was going into. Ideally, our son will be at the program through many classrooms and we want quality care to be a constant for him. Safe area and safe practices. Safety is important both inside and outside of the program. The facilities and location play large parts in that. But, it doesn’t end there. Safe practices are also huge. This includes emergency evacuation drills, close supervision of the children and positive guidance strategies, among many others. Meaningful, stimulating activities. We want our son to have a great experience in child care. What he does while he is there is going to mean a lot. Allowing him opportunities to play, explore and interact with his peers will develop skills he’ll need his whole life. This may mean putting the bouncy seat or flash cards away and getting out the blocks or bubbles. Cost of care. I wish this wasn’t one of our priorities. But, it is, just as it is for countless other parents. I was happy that on both of our lists, it was number 4, because that means that other things were more important to us than how much money we’ll be spending each week. We’re looking for a happy medium between dirt cheap and super expensive. Ultimately, though, we recognize that it’s hard to put a price on the important job of caregivers. Convenience and availability. This was my husband’s number 5. Naturally, we would want a program that was within a reasonable distance from our home, or is close to our work commute. And we have to understand that even if a program has everything that we want, they may not have the space to take our son. So, this definitely weighs into our decision making process. Step Up To Quality rating (or STARS for KIDS NOW in Kentucky). This was my number 5. And while I think it’s important, it’s not a deal-breaker. If I find a program that’s impressive, but doesn’t have a high number of stars, it is not going to disqualify them from my consideration. However, if we are deciding between two essentially equal programs, where one has a quality rating and one does not, it will be a big factor. This is not an exhaustive list. There are so many other things that we, along with other parents, will be looking for in a child care program. Knowing what types of things parents have in mind when choosing a child care can help you reflect on the services and practices of your program. Is there anything you are proud to provide in your program? I’d love to hear about it in the comments. We still haven’t chosen yet, and we’re not alone in our search. This entry was posted in Parents, STARS for KIDS NOW, Step Up To Quality and tagged choosing quality child care on May 21, 2014 by Janine Rigg. I have to say that fall is one of my favorite times of year. I enjoy the hustle and bustle of children headed back to school and participating in autumn-themed activities. I like the cooler temperatures and the changing leaves. There are smells and foods associated with fall and the changing seasons that just make me smile from the inside out. I truly welcome this change every year. 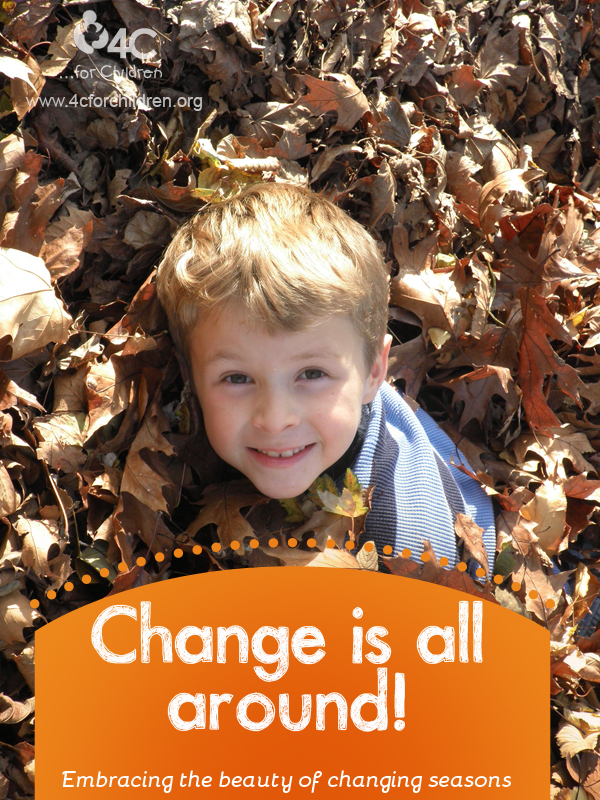 In addition to all of the typical changes associated with fall, there are also changes throughout the state of Ohio with Step Up To Quality. The set up of the program standards document is different. The terminology related to the rating system has changed. The organizational systems used by many programs for years seems like it’s changing too. In Kentucky, there have been updates to licensing regulations as well. These changes seem to be causing confusion. No one seems to be smiling about these changes in the same way that a child might smile when they jump into a pile of crunchy leaves in the fall. I want to encourage you to recognize that just like the physical changes that happen every fall, this type of change is good too. Even though we have to learn a new set of words and maybe even create some new systems to organize our paperwork, it’s all in the best interests of the children. My hope is that as you take time to learn the different pieces associated with Step Up To Quality in Ohio and licensing regulations in Kentucky, you also take time to breathe and enjoy the good work that you are doing for the best interests of the children in your care. When you face a challenge because of some of the changes that you see before you, please know that there are supports all around you. At 4C for Children we have leadership networks and coaches who are able to answer questions and provide supports through these changes. You can also reach out for support from friends and colleagues who are traveling this changing path with you. Accept the new systems and know that children will benefit. Most importantly, keep in mind the reason behind your work: the wonder in a child’s eyes as you teach him about what happens when summer turns into fall, and the smile on his face as he jumps into a pile of leaves and embraces the changing of seasons. This entry was posted in Directors & Administrators, Early Childhood, Step Up To Quality and tagged changes to SUTQ, child care center, child care providers, family child care on November 7, 2013 by angiegood. 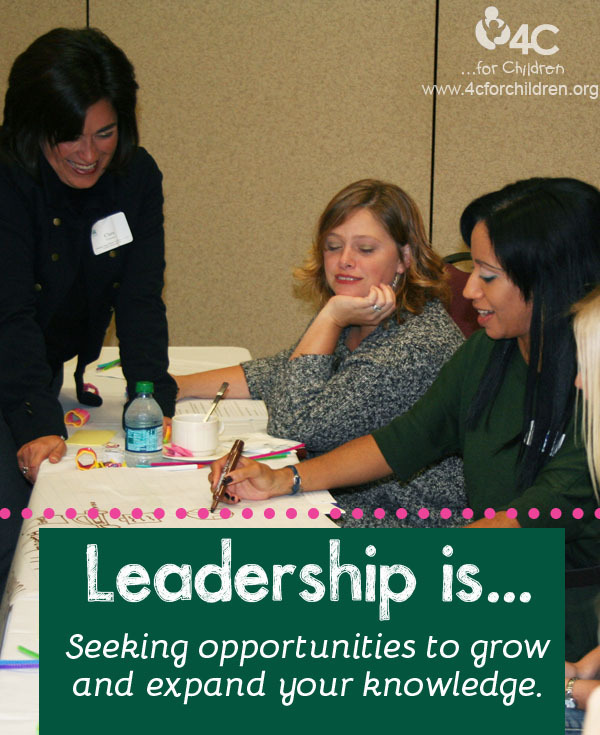 Like many of you, I was a director for almost 27 years and I cannot imagine a topic that I am more passionate about than leadership for early childhood directors. Some of the things that I have learned about leadership came from working with excellent role models, trainers, mentors and supervisors who set very high standards. The 11th Annual 4C Leadership Conference is drawing near and we are inviting you to participate in a two-day event at the Oasis Conference Center in Loveland, Ohio. The conference promises to be inspiring, motivational and full of sessions that will challenge you to aspire to new levels. On pre-conference day, October 10, John French from Lakeshore and 4C’s Kim Ginn will host a “Lunch and Learn” where attendees will have the opportunity to see how Lakeshore products align with Ohio’s updated Early Learning and Development Standards. You won’t want to miss the giveaways! The afternoon session will be spent with Cea Cohen Elliott. In her presentation “Balancing Life’s Challenges and Opportunities,” she will talk about taking time to care for ourselves and keeping our life in balance while still maintaining our sense of humor. On conference day, October 11, our keynote speaker, Michael Hingson, will deliver his address: “Out of the Ashes: Learning to Survive in a Changing World.” Through the compelling account of his harrowing journey out of the World Trade Center to safety on 9/11, Michael demonstrates how to face and embrace life-changing events in a constructive way. Michael’s story will challenge you to access and strengthen your skills, trust, teamwork, risk-taking and creativity to ease your way through changes in your work and personal life. Michael will also have his bestselling book, Thunder Dog: The True Story of a Blind Man, His Guide Dog & the Triumph of Trust, on sale at the conference. Good leaders are made, not born. Good leaders develop through a never ending process of self-study, education, training and experience. So register now for the 4C Leadership Conference. This entry was posted in Directors & Administrators, Early Childhood, Professional Development, Step Up To Quality and tagged cea cohen elliott, child care directors, directors & administrators, leadership, leadership conference, michael hingson on September 11, 2013 by 4cforchildren.